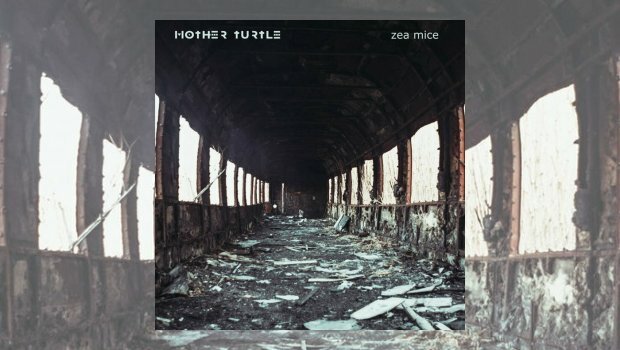 Mother Turtle are a Greek studio jam band who take their cues from nearly all aspects of progressive rock, a synergy of many ingredients tossed, fried, and served sizzler style to make this a very tasty reptilian matriarch. Zea Mice is their third, lyric free, album showcasing a line up of musical competence that belies the absence of international recognition – a Grecian take on Balkan, electronic, jazzy blues prog in the capable hands of these Apollo clones. A big bad synth drone forces the curtain call as the opening scene explodes into Greek shouting and guitar led frenzy but with the surprise addition of a saxophone smashing its way into the mix. The drums are old school with none of that annoying click on the kick that bestows so much of this type. Instrumental prowess is going to be the backbone of this show. Cornhub has Dixie Dregs in its violin melody as the guitar now chops itself into Crimson territory, but the lead acoustic six string brings it back to the Dregs. The snare is reminiscence of Bruford’s “doink” and the jazzy bass keeps the listener completely entertained. This is first class stuff. There’s also a string synth that sounds like they have Moon Madness in their record box, and have listened to it often. The beast with two humps is again an influence on Zea Mice (the track) and this album is already moved to the recommended aisle. The Byzantine aromas of the east waft in and out of the senses like an hour long tasting menu that delights at every course, especially with Vermins, an ode to the rats in the kitchen maybe? The notes are played out in a foreign minor tongue and the tension is great. Zea cytotoxicity is tested on mice and Mother Turtle are doing the same with humans, and it’s an experiment that’s having tremendous success. If you like your prog to be foot tapping, eccentric, and full on, then have a word in this band’s shell like.